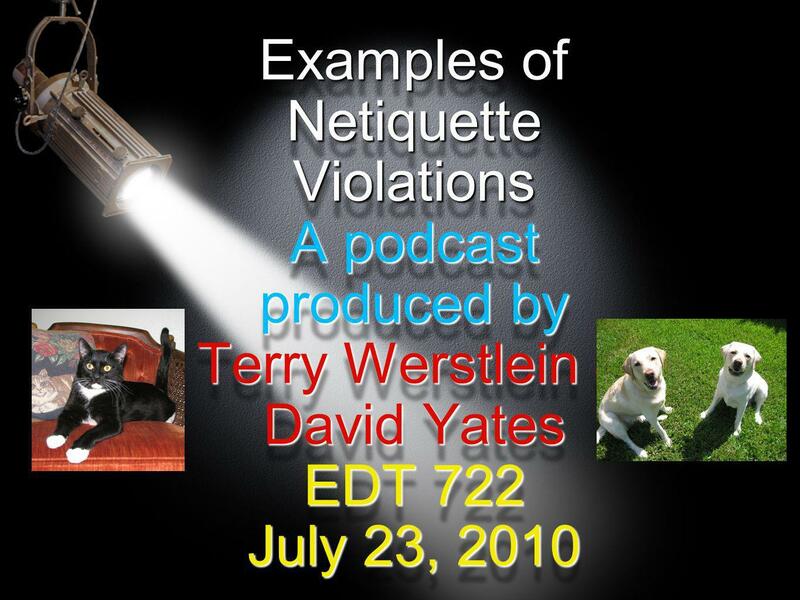 Examples of Netiquette Violations A podcast produced by Terry Werstlein & David Yates EDT 722 July 23, 2010. 5 6. They add variety and interest. 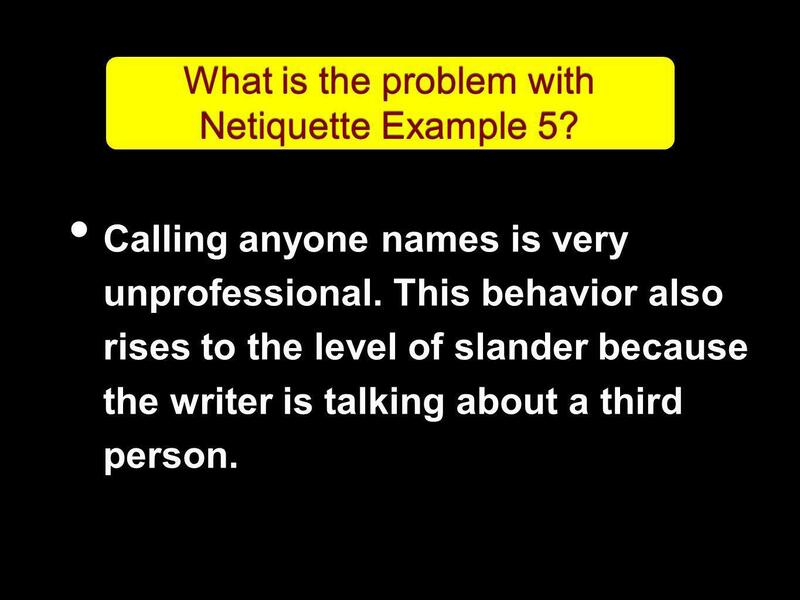 6 What is the problem with Netiquette Example 1? 7 6. They add variety and interest. 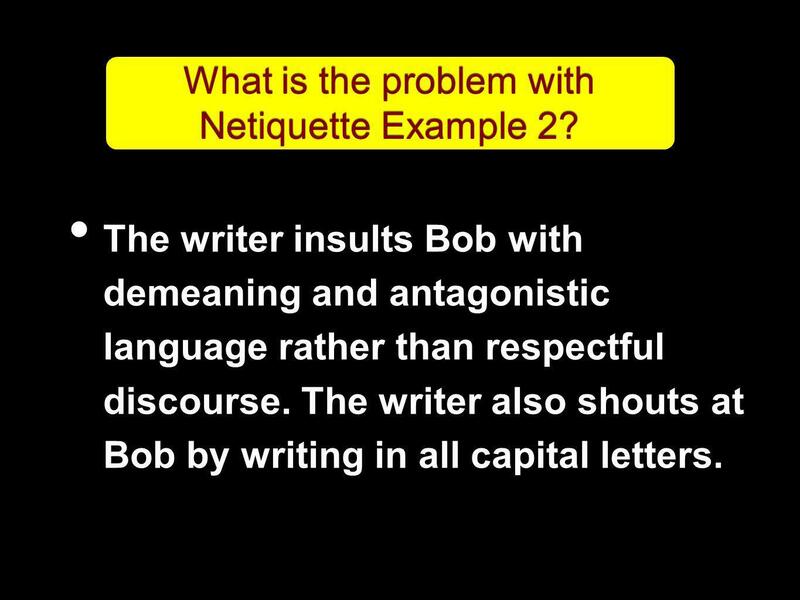 8 What is the problem with Netiquette Example 2? The writer insults Bob with demeaning and antagonistic language rather than respectful discourse. The writer also shouts at Bob by writing in all capital letters. 9 6. They add variety and interest. 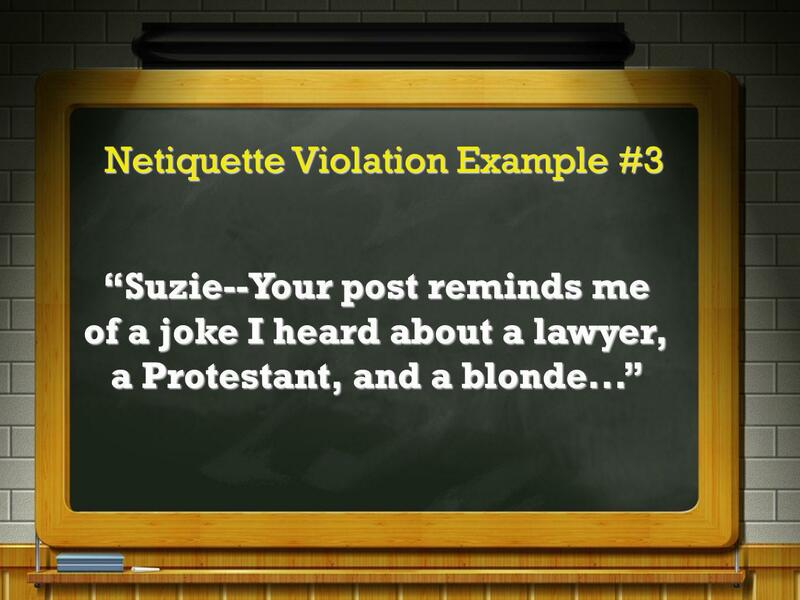 10 What is the problem with Netiquette Example 3? 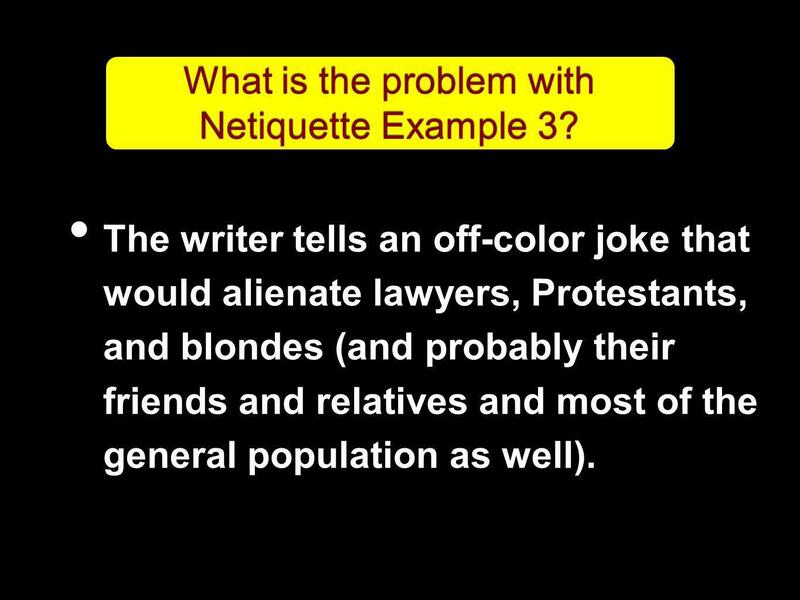 The writer tells an off-color joke that would alienate lawyers, Protestants, and blondes (and probably their friends and relatives and most of the general population as well). 11 6. They add variety and interest. 12 What is the problem with Netiquette Example 4? 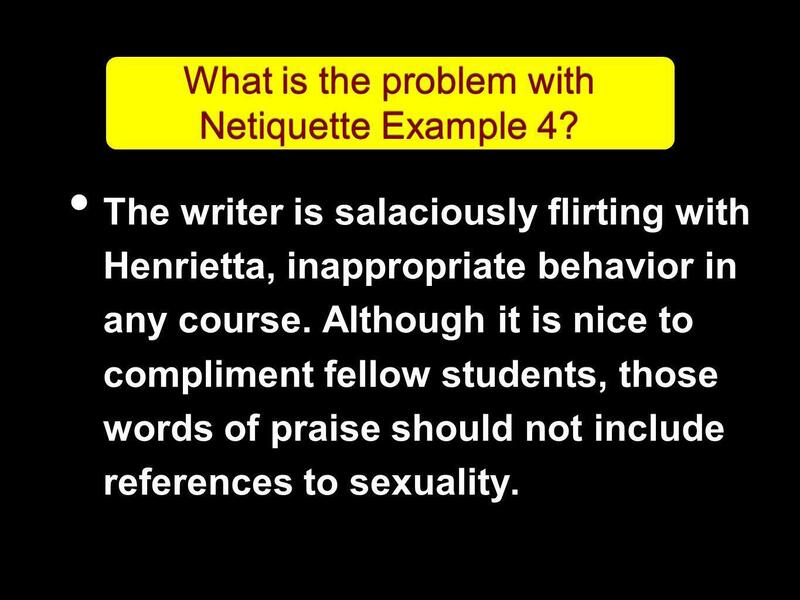 The writer is salaciously flirting with Henrietta, inappropriate behavior in any course. Although it is nice to compliment fellow students, those words of praise should not include references to sexuality. 13 6. They add variety and interest. 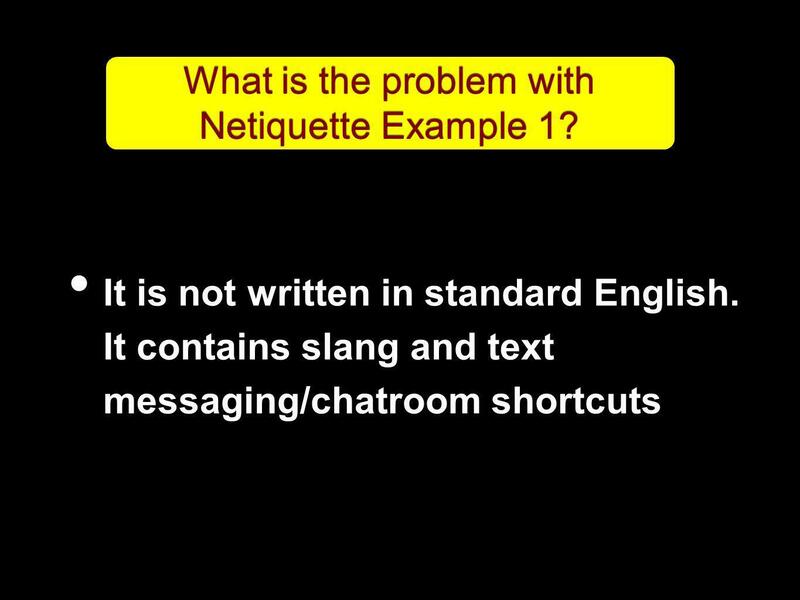 14 What is the problem with Netiquette Example 5? Calling anyone names is very unprofessional. This behavior also rises to the level of slander because the writer is talking about a third person. 15 References DeCandido, G. (2009). The fab ten of online ed. American Libraries, 40(12), 31. Hodson, C. (2008). Netiquette: Watching your P's and Q's in an online world. AANA Journal: AANA News Bulletin, 62 (10), Mintu-Wimsa, A., Kernek, C., & Lozada, H. (2010). 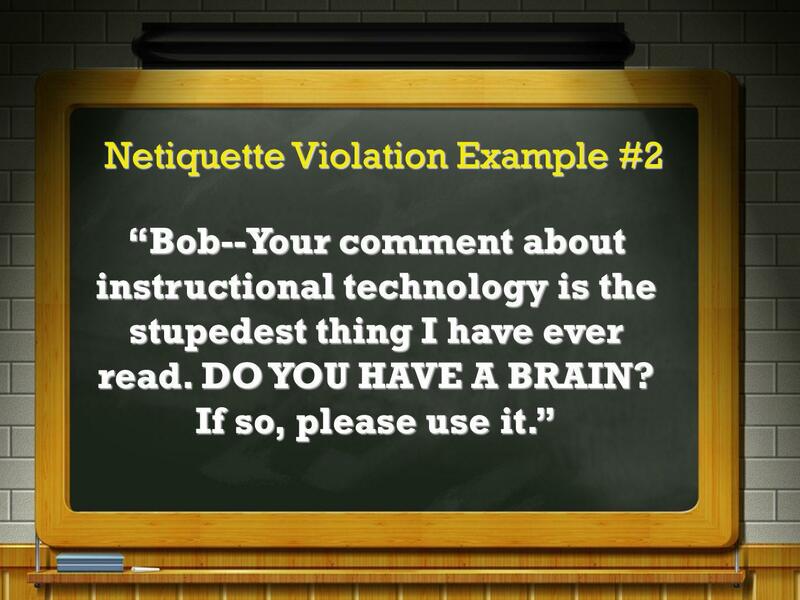 Netiquette: Make it part of your syllabus. 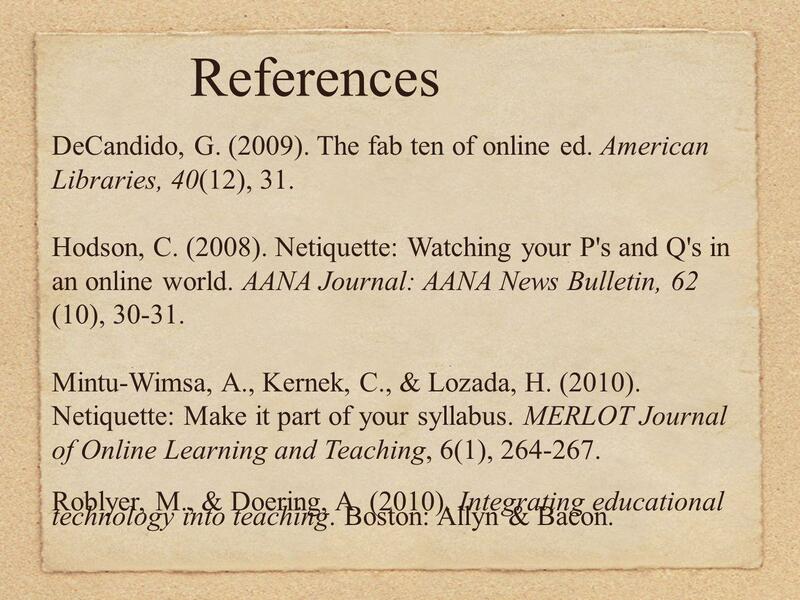 MERLOT Journal of Online Learning and Teaching, 6(1), Roblyer, M., & Doering, A. (2010). Integrating educational technology into teaching. Boston: Allyn & Bacon. Download ppt "Examples of Netiquette Violations A podcast produced by Terry Werstlein & David Yates EDT 722 July 23, 2010." 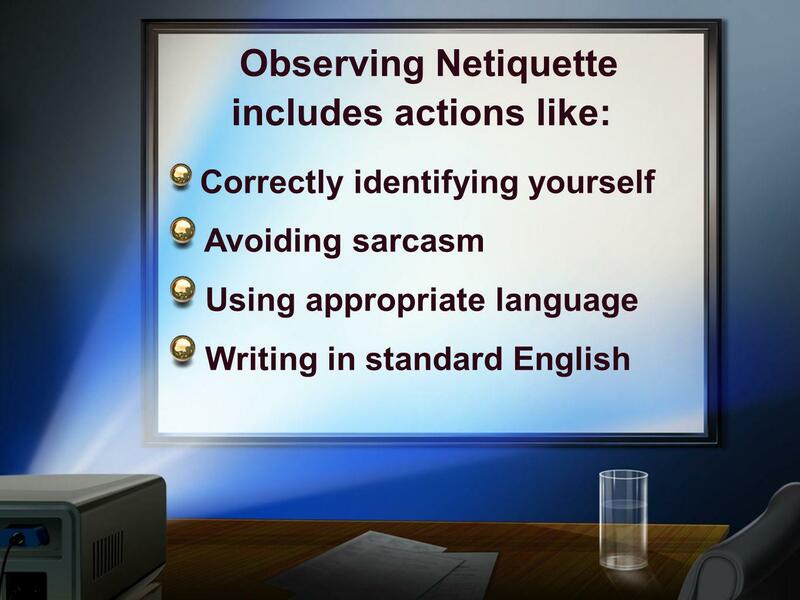 Online Etiquette Netiquette. Tips for talking online Keep it brief and to the point Dont use all capital letters, THAT MEANS YOU ARE SHOUTING! Dont use. 1 Effective Business Communication. 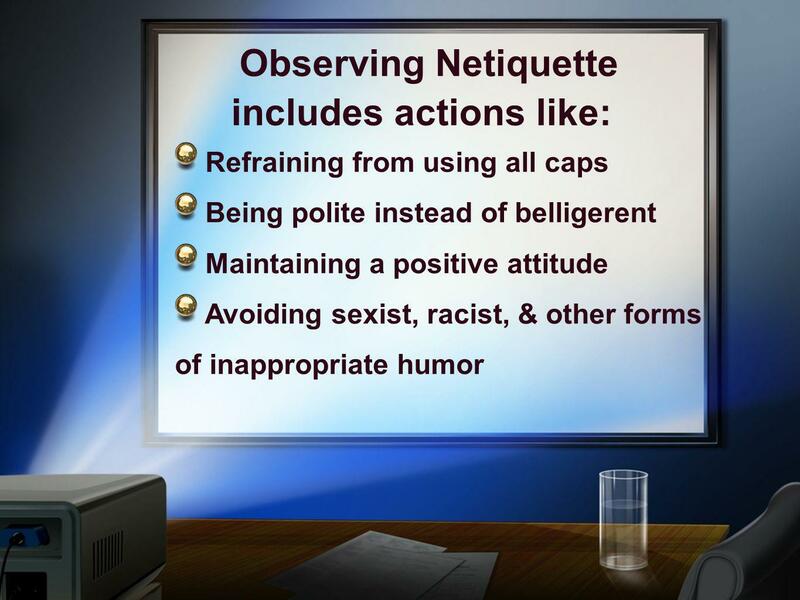 2 Netiquette = & Internet Etiquette message - No nonverbal expression to supplement what we are saying. Writing Contexts: or Text? Dr. Robert T. Koch Jr. Center for Writing Excellence February 10, 2009. Netiquette or cyber etiquette What is it? Correct behaviour online So what is correct behaviour online? ACTIVE LISTENING The ability to listen effectively to another person with whom we are having a discussion.  Define cyberbullying.  Identify activities which are considered cyberbullying.  Examine ways to prevent cyberbullying.  Learn online manners and. Internet Etiquette or Netiquette. Ten Rules Of Netiquette There are Ten rules of Netiquette that everyone who goes online should follow. You should remember. Define cyberbullying. Identify activities which are considered cyberbullying. Examine ways to prevent cyberbullying. Learn online manners and digital. Digital Citizenship L’école élémentaire Beachy Cove Elementary School January 2013. Netiquette Nelly Annie R. Computers period 5. 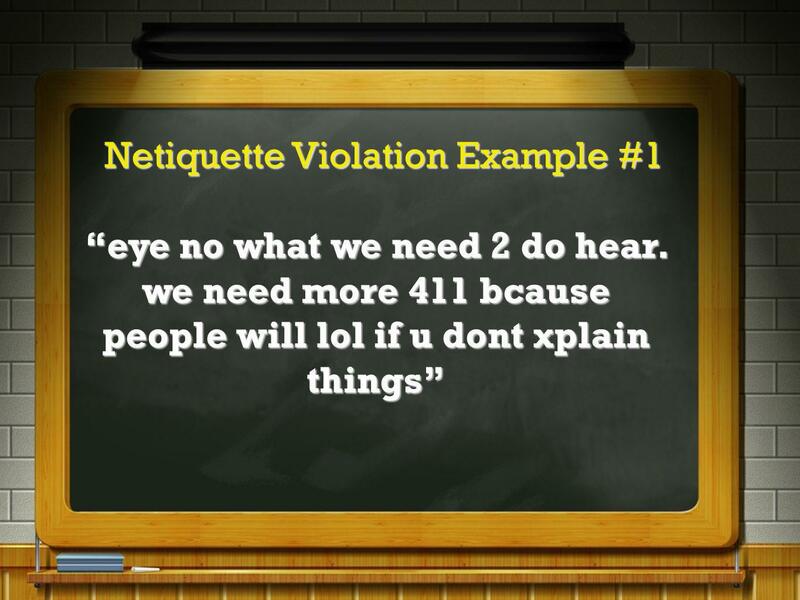 Netiquette Nelly  You should have proper behavior and treat people with respect  Don’t flame any one. Bullying Bullies are those people who gain gratification (a sense of happiness) when they have provoked or tormented others. They feel better by making. CKD SAFETY! By Caitlin, Kara, and Derrick. EMOTICONS.  Emoticons are symbols that can be created with an ordinary keyboard to represent a variety of. Digital Citizenship. Topics  Netiquette  Copyright and Fair Use  Plagiarism  Safety on the Internet  Safety on your Computer.